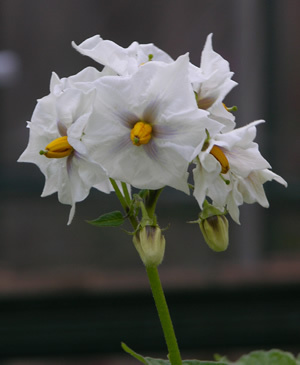 When I was little, I used to hear people making jokes about Russian potato farmers so, of course, it never occurred to me that potatoes are beautiful plants that happen also to be extremely easy to grow. Last year, I ordered six different varieties of heirloom potatoes, a mixture of white, red, blue, and purple. There were fingerlings as well as the more conventional types of potatoes. All grew easily and practically effortlessly. 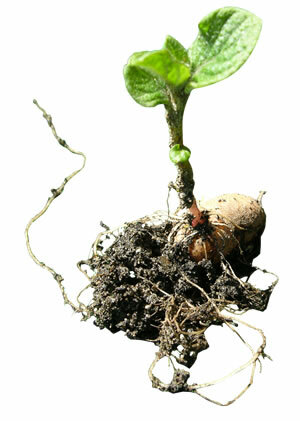 This is a potato that is eager to grow into a plant. Potatoes like moist, slightly acidic soil. If the pH of your soil is more than 6, you can add pine needles. This plant is only a few days old. This is from the Peruvian Purple plants from last year. As I said, potatoes are very easy to grow. The late Emilia Hazelip, an exponent of Fukuoka Farming, placed the potatoes on dirt or cardboard (with holes) and covered them with straw. When they were ready to harvest, she simply moved the straw out of the way, and there was a beautiful potato, no dirt even! Others fill bags with soil and put a few potatoes into the bags and keep adding soil as the potatoes grow. When they are ready to harvest, usually 50-60 days, just slit the bag and pick up the potatoes. In comparison, I did things the hard way! I actually had to wash my potatoes. When you grow potatoes, you keep adding soil as the plant gets taller. In most cases, you do not plant potatoes in the same place two years in a row. 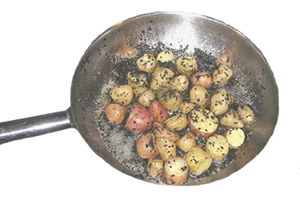 Black cumin seed fried red and fingerling potatoes. 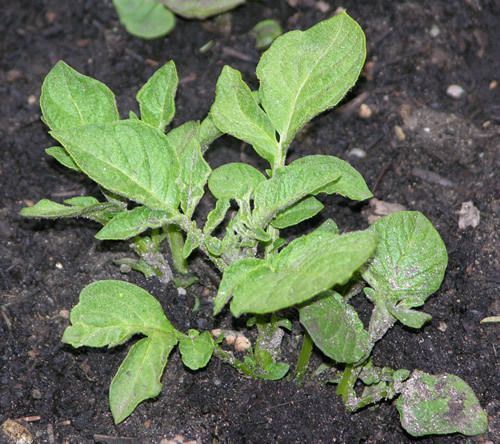 The innovation I am implementing this year is that I have planted comfrey next to the potatoes and will use the comfrey leaves for mulching the potatoes, trying this year to use more mulch and less dirt. 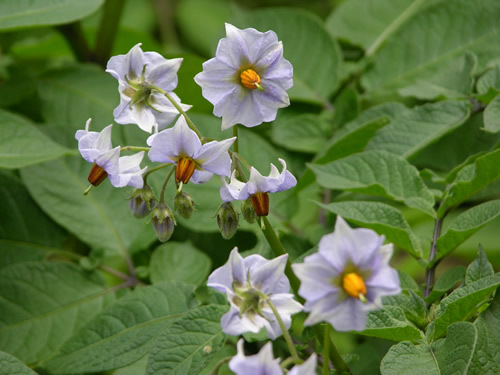 You can harvest the potatoes when the leaves are withered, but it is safe to leave them in the ground for another 4 weeks or so even after the leaves lose some of their glory. Be sure to keep some potatoes for planting the next year . . . or just leave a few in the ground. 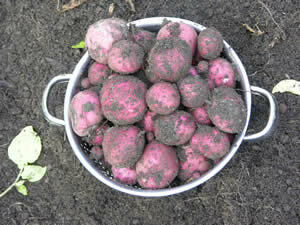 They are perennials but since it is the tuber that is eaten, usually the whole plant is harvested. Why should you grow your own potatoes? According to the Environmental Working Group's 2006 report "Shopper's Guide to Pesticides in Produce," potatoes are among the 12 foods on which pesticide residues have been most frequently found. Therefore, individuals wanting to avoid pesticide-associated health risks may want to avoid consumption of potatoes unless they are grown organically.